Q: How are your photography workshops conducted and what is usually included? A: Our photography tours bring participants off the beaten trek to photograph local scenes, activity and panoramas. We tend to wake up earlier than usual for sunrises (if included) and stay out shooting all the way till night after the sun sets. We also spend more time on location for us to find our angles and perspectives and instruction is usually provided on what settings to use and how to shoot certain scenes. On certain tours, staged/model shoots are also conducted to add more depth and variety. Q: When will your workshops confirm? A: We will confirm our workshops once we have achieve a minimum number of participants. Status for our workshops are updated every week on our website under the Photography Workshops section. Q:What happens if there are not enough participants? A full refund of your $100 deposit will be refunded within 7 working days of the workshop cancellation / postphonement. Q: Is the International airfare included? A: No, International airfare is not included. Our program commences at the destination itself and all participants must ensure that they arrive at approximately the same time as the main group. Do refer to the Tour Inclusions & Exclusions to find out what is included in your photography package. Q: I wish to arrive on a different flight, is this possible? A: Yes you can arrive on any flight, even a day or two earlier, as long as you meet up with the group at the airport on the first day of our program. Do note that airport-hotel transfers are not provided if you arrive at a different timing. If your hotel is nearby where we are going to stay, we may pick you up from the hotel depending on the itinerary. Q: I am registering as a single traveller, how can I avoid paying the single supplement charge? A: You can indicate that you wish to share a room with another single traveller so that both of you can save on the single supplement charges. However, this is strictly subjected to availability. If we are unable to pair you off, you will still need to incur the single supplement charges. Q: I am not a professional photographer, can i still join your photography tours? A: Our photography tours are designed for all levels of proficiency, whether you are starting out as a serious amateur, or a professional stock photographer, you are more than welcome to join our photography tours and learn more about photography. Q: My spouse / child is not into photography, can i bring them along? A: Yes you can, however, do note that our tours usually do not include any shopping and tend to spend more time at various locations (for us to find our angles and perspectives). We also provide very basic training for point and shoot users so that they can also pick up the hobby if they wish. Q: I have submitted a tour reservation using your online booking system but have yet to hear from you, what happened? A: We will reply to all tour reservations within 3 working days. You may follow up with us again at info@sgtrekker.com if you do not hear from us within 3 working days. Do also ensure that when submitting your tour reservation online, you will need to also pay the deposit (via PayPal). Without a deposit payment, your reservation form will not go through and we will have no record of your participation. Q: I wish to make payment via another medium (eg. Interbank Transfer, Cheque, etc), is this possible? Q: What are FIT treks and on what dates do your treks depart? A: FIT implies Free & Independant Traveller. You decide on what dates you want to depart yourself. Your group will be a private group and will be assigned with your own guide. We do not offer a tour pairing service. Q: I wish to register for one of your treks, can I depart alone? Q: If I register for a trek, how many people will I be travelling with? A: All our treks are private treks that depart daily. You will be assigned a guide and porter and will travel alone (if you have registered as a single pax). We do not offer group joining treks. Q: Is International airfare included in your trek packages? When do I book my airfare? Q: Do I need to apply for a travel visa before arriving at the destination? A: Most of the locations we organise have a VOA (Visa on Arrival) facility. For example in Nepal, you just apply for the VOA upon arrival at immigration. A 15 day visa will cost USD$25 and require 1 x passport sized photo. For other countries eg. Indonesia, visa requirements are subjective (eg. Singaporeans do not require visa to enter Indonesia), while in India, visas have to be applied online and at the embassy in Singapore before you even fly. Email us at info@sgtrekker.com for more details. Q: I prefer to stay in another hotel that is not listed on your website, can I change the hotels? Q: I wish to customise the itinerary, is this possible? Q: What type of clothing do I need to bring? A: The clothing you require for your trek will greatly depend on the destination (eg. Nepal vs Indonesia) as well as the time you intend to visit (Winter vs Summer, Rainy Season vs Dry Season). Basic gear such as a good pair of trekking shoes (with grip, eg. Teva) and a jacket (dual layer) is recommended. A recommended packing list will be included in the tour voucher after you have submitted your booking. Q: For my luggage, can I bring a trolley bag or one of those backpacking haversacks? A: There is no restriction on the type of luggage you can bring however, a backpack haversack with its straps will be easier for the porter to carry. Q: Are your treks tough? Do I need to be physically fit to participate? A: Our adventure treks will require a certain degree of fitness. However, sufficient time has been allocated for you to complete your daily trek. Expect to trek about 6-8 hours per day and the average distance covered is about 12-16km per day. It would be advisable to seek a doctors opinion first should you have any pre-existing medical conditions. You should also let us know in advance of any such conditions so that we may provide better judgement and assistance. Q: Is there any medication that you recommend for your treks? A: We usually recommend bringing Panadol and Charcoal pills. If you are trekking above 2500m, AMS pills such as Diamox are highly recommended. Diamox can only be purchased with a prescription and should ideally be taken 3-4 days prior to beginning your trek. Side effects include a slight nausea as well as constant urination so it is normal if you experience such symptons. Consult your physician for more information. 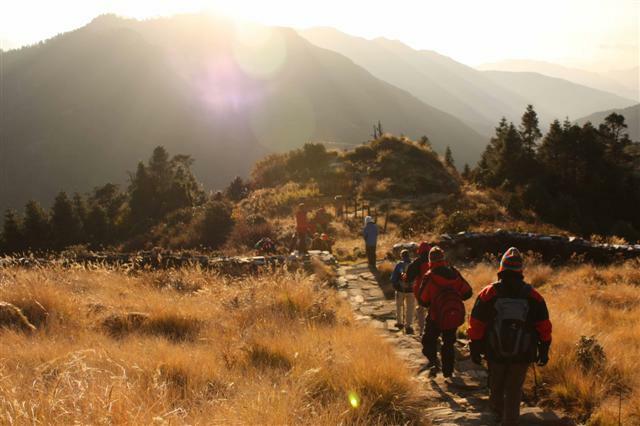 Q: Do we need to purchase travel insurance before embarking on a trek? A: Yes definintely. Travel insurance will cover baggage loss, flight delays as well as the all important emergency medical evacuation in the event things go terribly wrong. Recommended insurers include CHARTIS, Great Eastern and DirectAsia.com. Do also remember to bring along your travel insurance policy while on trek. Your policy will include a 24 hr hotline as well as your policy number and details. It is also prudent to hold on to your travel documents eg. ticket stubs, invoices etc so that we may assist with further documentation in the event of a claim. Q: I have 5 pax who wish to participate in an adventure trek, how is your rooming list decided. A: With 5 pax, we will room four pax together on a twin share basis. The 5th person will have to incur a single supplement charge. This is the same for any odd number of pax in the group eg. 3 pax, 7 pax, 9 pax, etc. Depending on available, we can try to room 3 pax in a Triple Room to save on the single supplement charge, however, due to the remote areas you are trekking to, this is not always possible. Q: What kind of conditions can I expect while on trek? It is uncomfortable? A: Most of our trekking destinations are in 3rd world countries where comfort is a premium. For example in Nepal, sanitation levels are considerably low and electrical outages are very common. Rooms on a tea house trek are basic wooden rooms with 1-2 hard beds and a thin matteress. Electricity is usually not available until in the evenings unless you are in one of the larger villages and charging facilities are scarce. Hot water baths can also usually be purchased for an additional fee during treks, otherwise, for higher altitudes, we recommended powder baths (with antiseptic powder) and wet wipes. Toilets are also most of the time communal. While creature comforts are low, the serenity and beauty of the mountains and wilderness will more than make up for the shortfalls. Q: What kind of food is served during the trek? Is it safe? A: The cuisine served will depend on the destination. For example in Indonesia, the accompanying chef will prepare local food such as mee goreng, chicken noodle soup, fried rice, sandwiches, etc. In Nepal, you stay in Tea Houses where you can find a wide array of meals from Dhal Bhaat (vege curry rice), fried noodles, rice and even meat such as chicken cutlets, etc. In place like India (eg. Ladakh), your meals are usually noodles and rice. You can bring your own canned food to supplement. As you are travelling in the great outdoors, common sense should prevail. Avoid raw vegetables, ice and semi-cooked food. Bring along your own medication such as charcoal pills in case of emergencies. Q: I may wish to get another porter to just follow me around and carry my personal luggage, is this possible? A: Yes it is, you can hire a porter at an additional cost. Cost will differ according to destinations, regions and seasons. Email us at info@sgtrekker.com to find out more. Q: I have submitted a booking for one of your treks, what’s next? A: Once you have submitted a booking, we will require about 3-5 working days to confirm your trek availability (eg. hotels, domestic flights if included, train tickets, etc). Once we have blocked your travel components, we will request for full payment. Upon full payment, a travel voucher will be issued and you can present this to the representative who will pick you up at the airport. The travel voucher will contain all contact information (including our 24 hr hotline), tour services included (and excluded), the itinerary as well as a recommended packing list.